IISER Admit Card 2019: The Indian Institutes of Science Education and Research Conducts this examination, these institutes are a group of premier science education and research institutes in India. To take admission candidates have to try their best and do all the required preparation and hard work. 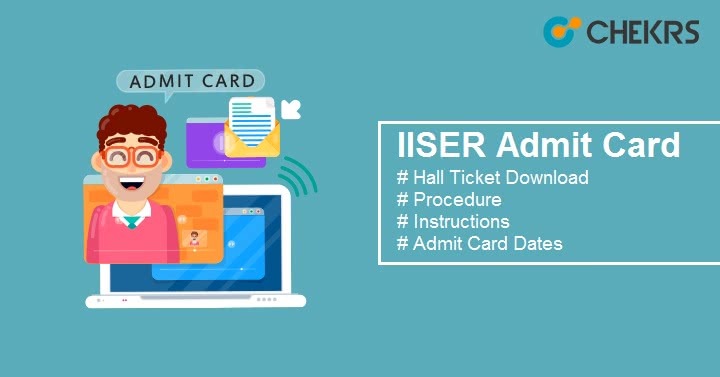 In 2019 the IISER Hall Ticket or Admit Card for SCB was released on 18th June 2019, and in 2019 it is expected to be released in the same period. In this article we are going to show you the method to download the admit card for IISER 2019 Examination. Admit card will be only released for State and Central Boards Channel (SCB).For KVPY & JEE Advanced Streams there will be no Aptitude test so no Admit card will be available to them. IISER Aptitude Test Admit card will be available in the month of June 2019. Candidates can all the details of Post-Form Filling events and their respective dates from the below table. The Admit Card will be available through online mode only. Candidates have to visit the official website to download the admit card. The procedure is given below. First of all visit the official website of IISER Admission i.e. iiseradmission.in. Now click on “Login” and enter registration details such as Email ID and Password. Make sure that these details will have to be same as you provided at the time of registration. Now, fill the security code and click on “Submit” button. After it, Find the link with text “IISER Admit card” and click on it. The admit card of IISER will appear on the screen. Download it and take a print-out of it. Admit card will be available for only those students who successfully submitted the IISER Application For. IISER Aptitude Test Admit Card is a really important document; make sure to keep it safe till the admission. Candidates have to carry one Photo id along with the IISER Hall Ticket at the examination center. Candidates can carry one of these along with Admit Card. The Allowed documents are: Voter Id, College ID, Aadhar Card, College ID, Driving License etc. We hope you will download IISER Admit Card without any problem. If you are facing any problem, you can contact us through the comment section. And if you got your Admit card, Just finish/ Revise the syllabus and get prepared for the exam. Good Luck and keep visiting.